What do you prefer hearing at conferences? When I talk about “edgy” stuff (yes, blackhat), the presentation is far better received by the audience. On the flip side, presentations about everything else tend not to quite as popular. Don’t get me wrong, I have invested huge amounts of time and energy into building decks, doing research, presentation training and so on – its just those talks never “feel” as positive as the other stuff. In theory the talks with grey-hat hints and tips are less likely to be widely actionable, so therefore are of less use. So are they more popular? Interesting question. I think the reason why people like the grey hat stuff so much at conferences is that most of the white hat stuff that gets given out is easily searchable. People in our industry read industry leading blogs regularly, so most of the new actionable white hat tips and tricks people have either heard or read before as people blog them. I enjoy hearing about both. To be totally honest though I find Black Hat slightly more interesting at conferences. There is plenty of great coverage, and examples of White Hat in action all over the web/at conferences etc, but Black Hat seems a bit more of a secretive. Hearing what the latest tips and strategies for gaming the system is fascinating to me, and can be useful sometimes (even for a White Hat practitioner) :-). I agree with Jim’s comment completely. White Hat best practice examples are blogged about every day, and although there are shining case studies which are great to learn from, it’s always nice to hear something a bit different at a conference. A few of us in the office like to have a chat about Black Hat we’ve heard about regularly purely because it is so interesting to see what actually works, and we are not reading about it all the time. I also think that even us Whit Hate practitioners can learn from the “darkside”, which might turn us slightly grey on occasions! I agree with Jim, the difference is that most white hat presentations go over such familiar ground that they get repetitive. “Do outreach, write great content, this is how to pitch email” etc etc. The stuff I personally find interesting is just the “behind the scenes” glimpse. This doesn’t have to be black hat, just simply an insight on how does another agency link build, what prices are being paying for various link services, how would they spend a given budget, what’s the descision tree they go through. The black hat presentations fall into that category for me. We are unlikley to ever apply it to a paying client site in agency life, but it’s the interesting stuff as it’s not what we do day to day, yet still applicable. 2. Just because we are learning about black hat tips and tricks at conference, doesn’t mean we’re going to use them but it may help to understand what someone else is doing. Black hat is most interesting. Even if the audience is totally white hat, the smart ones will come away with quite a few ‘I can make that work in a different way’ type ideas and lots of ‘Jeez, if I’m having to compete with this dark stuff, I really have to up my game”. 3) because BH reveals the flaws of the algo, hence we can understand better how it works from that. I didn’t learn anything in the last 2 conferences…the dark side all the way! I’m certainly looking forward to your presentation at ionSearch on April 18th. 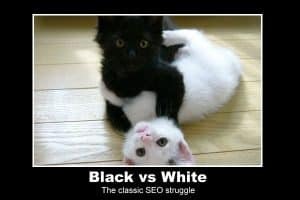 I personally think that as an “SEO” we should be aware of blackhat tricks, after all it doesn’t mean you have to use them, but you need to be on guard; especially in competitive niches. I don’t use any black hat tactics, however I always feel short-changed when I attend a conference and only hear the ‘write good content, create a community’ script. For me, I just want to hear practical tips/tactics that work in the real world, not theorising (be it white or black hat). Most tactics fall somewhere in the grey area anyway, and I’d like to be told the facts and left to my own knowledge and experience to decide the potential risk factor. thats pretty much the same viewpoint as I shared when I was attending conferences up until about 18 months ago. I think that the single presentation that made the most difference to both my career as an SEO, and the way that I present, was watching Mikkel DeMib speaking at SMX London (think it was in 2007?). His presentation style was upbeat, the stuff he was talking about was actually what I was doing at that point in time (you might have called it blackhat, but to be honest I was just doing what I needed to do at that point to rank well). He was the first person I saw in this style, and its fairly safe to say that I have modelled my talking on this format. Absolutely +1 on that comment. Everyone should *know* about blackhat – whether they use it or not! I don’t always go to SEO conferences but when I do I prefer Black-hat talks. Stay thirsty my friends.